How much young forest do we need? Most people know that wildlife needs mature forest. 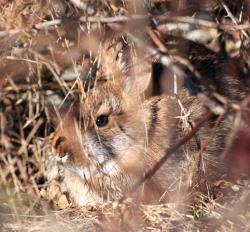 They understand that grasslands and wetlands are also highly valuable to our region's wild creatures. Another type of habitat is less well known, yet every bit as important if we are to have diverse wildlife and a healthy land. 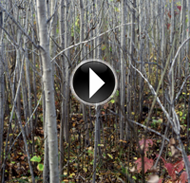 It's called young forest, and it's essential for many different animals from small reptiles to large mammals. 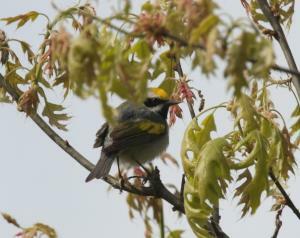 Many birds need this habitat, too, including ones that breed and nest in mature woods. Young forest is used by rare species of wildlife and by those that are more abundant. Some of the animals that need young forest are ruffed grouse, American woodcock, and whippoorwill; bobcat and Appalachian and New England cottontail; and box turtle, wood turtle, and green snake. White-tailed deer, wild turkeys, and a broad range of songbirds also rely on the food and cover offered by young forest. Unfortunately, the amount of this habitat has dwindled over the last 50 years, and as a result, more than 60 kinds of wildlife have suffered serious population declines in New England, the Mid-Atlantic states, and the Midwest. What is young forest? It's the shoots and sprouts of young trees springing up again in incredible numbers from the root systems of older trees following a timber harvest. It's an old field filling in with saplings and shrubs. It's a swampy tract thick with shrubs. Young forest can be a pine barrens greening up again following a controlled burn carried out by a trained fire crew. To keep the land healthy, we need a balance of different habitats. As we have come to understand the value of wetlands, we’ve stopped draining them and even begun restoring them. We've protected thousands of acres of older forest, benefiting the animals that live there. Now we must meet the challenge of providing enough young forest for wildlife. Collaboration between partners leads to more efficient use of funds and more creation of young forest for the animals that need it. Conservation partners use science-based Best Management Practices to create young forest in locations where it will do the most good to keep common creatures abundant and help wildlife whose numbers have been falling. 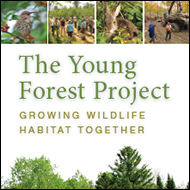 Many agencies, organizations, land trusts, companies, and towns have joined the Young Forest Project and begun making this important habitat on lands they own or manage. 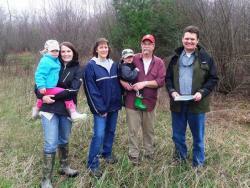 Private landowners are also key to this partnership. 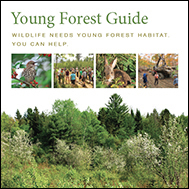 Landowners who want to help wildlife can consult the non-technical Young Forest Guide to learn more about creating habitat. The How to Make It section of this website offers more information. And check out Resources to download publications, guides, and manuals that offer additional knowledge. Want to see some young forest? A growing network of demonstration areas lets landowners and nature-lovers check out this habitat and the wildlife that thrives there. We believe that when people understand the importance of young forest and why conservationists are using management techniques to create, renew, and maintain it, they will welcome and support these actions so urgently needed to safeguard our native wildlife. This website introduces the wildlife that depends on young forest. It shows how partners are carefully recreating the kinds of natural events that once provided a steady supply of young forest. It tells the story of how your neighbors – owners of working farms and woodlands - are helping to create this valuable, vibrant habitat. If you decide to make some young forest, these contacts can help. Your state wildlife agency can also provide advice. The U.S. Fish and Wildlife Service and the USDA Natural Resources Conservation Service help conservation-minded landowners help young-forest wildlife. Organizations like the Ruffed Grouse Society, Pheasants Forever, and National Wild Turkey Federation can also help. Professional foresters can lay out and supervise commercial timber harvests that can generate income while improving conditions for wildlife. For non-commercial projects, full or partial funding may be available. In most cases, young forest lasts only 10 to 20 years before it becomes older forest, often less useful to wildlife. Making and renewing young forest is an ongoing task – and one that can be done in a way that delivers sustainable forest products while providing critically needed homes for our region’s wildlife. This cooperative effort helps preserve our natural heritage for our children and grandchildren. Welcome to the Young Forest Project.